I don't know what's happening where you are, but here there has been a definite shift in mood; one that swings from bubbling-under-the-surface-joy, to bah-humbug. Yes, the first snow fell; snatches of Christmas carols can be heard here and there; the faintest glimmer of panic has appeared in shopper's eyes. The Christmas season is upon us. How it catches us by surprise year after year is a mystery to me, yet year after year, we find ourselves caught off guard by its arrival. The stress of the season, though, is not mandatory. A few minutes of simple planning can help you breeze through the holidays, rum-laced eggnog in hand. So let's get started on planning shall we. We'll take this day by day. We'll shop for gifts - even for the most hard to shop for individuals. We'll trim the tree. We'll wrap our parcels. We'll plan a festive affair. And at the end of it all, we will fall into bed and let visions of sugar plums dance in our head. So today, let's check off the most onerous task on the list: Shopping for the men-folk. I can't exactly speak for the men of the world, but I suspect that they must get a little tired of receiving the same old things every year: cologne box sets, itchy sweaters, slippers, and nose-hair trimmers. This year, let's shake it up a bit and give them something they may actually want. First of all, let's start with the men who don't actually mind the boxed cologne gift-sets, but need a bit of a push out of their comfort zone. 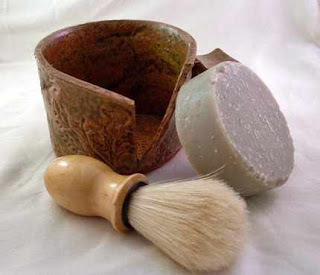 The first item is a gorgeous hand-made shaving mug that comes with a shaving brush, and a handmade shaving soap. Both the mugs and soap are created by martisart. To accompany this gift, what well groomed man wouldn't love to have his very own beer soap, perhaps in an luxurious scent such as Wood Cashmere? 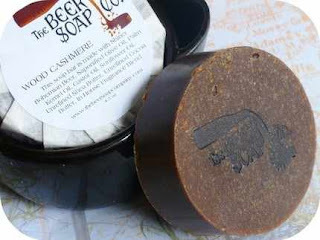 These soaps which yes, are made with real beer, are made by thebeersoapcompany. Is your man dapper, and well-dressed? Or would you like to encourage him to be? Try outfitting him with a couple of these beautiful handmade accessories. 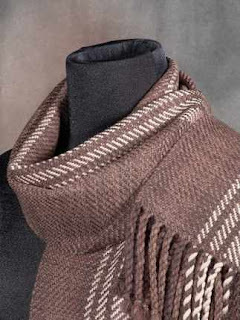 First, a lovely warm scarf, from thescarfguy, handwoven from 100% merino wool. 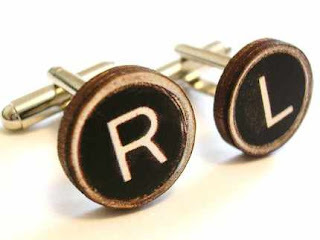 Next, maybe a set of cool Cufflinks cufflinks, re-purposed from vintage typewriter keys. Does your man need a little help with organization? Do you cringe when you hear, "Honey, where's my...?" Here are a couple items that can help, and each comes with the sumptuous smell of leather as an added bonus. 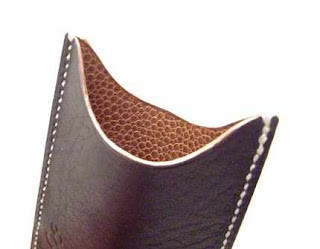 The first is a beautiful leather card case made by sakao. 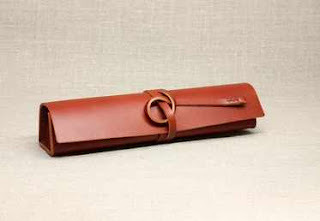 The next item is a fabulous hand-stitched leather pencil case from chiidesigns. Do have you an outdoorsman on your list? 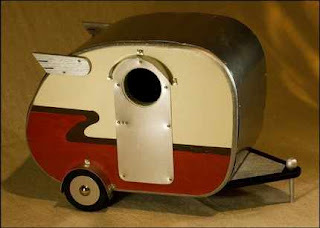 For a man who enjoys camping and waking to the warble of the birds, how about this fabulous vintage camper style birdhouse from jumahl? Maybe you have a man who enjoys a tipple or a drink out with the lads now and then? Well, here's a perfect item. 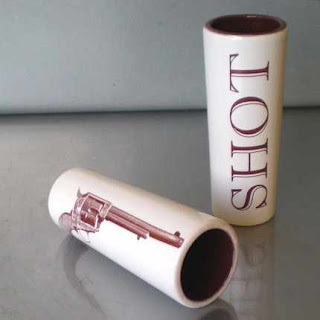 A truly literal shot glass, handmade by ofminedesign. And finally for the introspective artistic type, those who prefer to be on the outside looking in, here is a perfect gift. 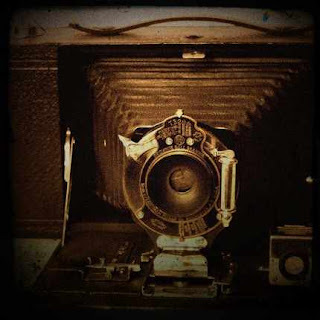 This photo by beautifuldarklight is of a vintage camera and is printed in warm sepia tones. I hope you have found some inspiration here. If you have others on your "nice" list, and you are stumped about what to buy, stay tuned for more ideas.